A case for ‘fast track’ building of new nuclear reactors to counter global warming, to increase security of electricity supply or to plug the gap envisaged by the closure of existing power stations has not been made. 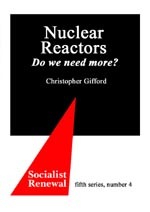 Nuclear stations could not be appraised, licensed and built in time. Energy from renewable sources has the greatest potential for reducing C02 emmisions but infrastructure changes, notably in the grid and in load management, will be needed. When adopted, we will have a cleaner, healthier planet, and a sustainable way of life.